Here is a set of mazes for your young learners to help develop eye-hand coordination. They are also a great way to develop their overall motor skills and spatial perception. 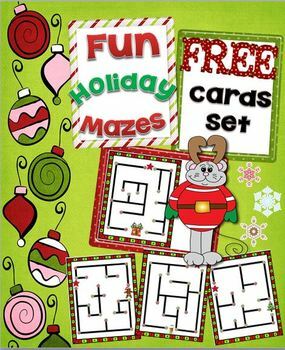 Included in your download are 10 holiday mazes that can be printed and laminated on cardstock to be used as wipe-off cards. Students will have fun as they try to get to the picture at the end of the maze. All mazes begin at the red star and end at the holiday themed picture. Mazes solutions are included in your download. Happy Holidays and thanks for downloading.